Citric Acid, Malic Acid, Acesulfame Potassium, Natural And Artificial Flavor, Sucralose, FD&C Blue No. 1. As a dietary supplement, mix 1 level scoop of Signature BCAA in 10oz. of water and drink within 30 minutes after workouts. Also, it's great to sip on throughout the day. Citric Acid, Malic Acid, Natural And Artificial Flavor, Acesulfame Potassium, Sucralose, Sunflower Lecithin, FD&C Blue No. 1. Citric Acid, Malic Acid, Acesulfame Potassium, Sucralose, Natural And Artificial Flavor, FD&C Red No. 40. Citric Acid, Malic Acid, Natural And Artificial Flavor, Acesulfame Potassium, Sucralose, FD&C Red No. 40. Citric Acid, Malic Acid, Natural And Artificial Flavor, Acesulfame Potassium, Sucralose, Sunflower Lecithin, Beta Carotene. Contains soy and is manufactured in a facility that uses materials containint milk, wheat, egg, and peanut. Mix one scoop (5 grams) with 6 to 8 oz. of water or juice. Take one serving immediately before your workout. For optimal results take additional serving during your workout. On non-training days take 1 to 2 servings throughout the day. Serving scoop included, but may settle to the bottom during shipping. Protein is responsible for tissue growth and repair, which makes it essential for building muscle. * Amino acids are the building blocks of protein; they're required ingredients in any muscle-making recipe. Not all aminos are created equal, however! The brached-chain amino acids (BCAAs) are of particular interest to those looking to build muscle, reduce breakdown, and promote recovery. * The BCAAs are L-Leucine, L-Isoleucine and L-Valine, and they're three of the most important essential aminos for muscle repair and growth. * BCAA Powder contains these aminos in a precise 2:1:1 ratio for the best possible results. 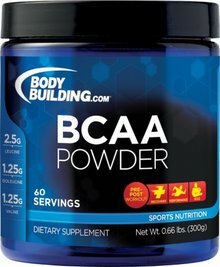 Note that BCAA Powder is an incredibly versatile supplement, so don't be shy about adapting it to your needs! If you prefer fasted cardio in the mornings, for example, BCAA Powder is the perfect choice before and during your workout. Or, for a general lifting session, mix a couple scoops in a shaker bottle and sip on BCAA Powder as you train.